Well, I did it myself but I finally have a book published. The release date is tomorrow, Tuesday November 24. The eBook is available on Amazon for pre-order any time, and a paperback version is available through Amazon or CreateSpace. Seeing my book guts show up on the “Look Inside” function for the paperback gives me shivers. There has been a bit of a gap in progress between the last post where I awaited my ISBN numbers, and I will fill in a little here. The publisher registration came in late, but did happen, allowing me to assign my own books their ISBN numbers. I added them to the front matter of my manuscripts (on the copyright pages), re-uploaded the text files to Amazon, and set the release date! Things have been crazy through all of it. I kept my promise to myself to participate in NaNoWriMo this month, so I have been writing a new novel while promoting the previous one at the same time. My film contract meanwhile extended right up to the end of October. Then last week the attacks on Paris threw me sideways and for a while I haven’t felt right about promoting a smutty romance in the face of things. Then again, a nice escape might be just the thing for some. I also chose to celebrate the publishing with a small launch party at my local pub—the one with the best Scotch, of course. The place has also always been very supportive of local artists and welcomed my thought of hosting a celebration. I’m nervous, and will be glad for the good Scotch. I ordered an extra five proofs of the paperback version (from CreateSpace) to sign and give away during the launch, and made sure that the pub would avail my guests of wireless access so they are able to buy the book on-line if they choose to. I’m not planning on doing a reading. I might be too drunk anyhow. Lining up the timing of the electronic release with the paperback versions did prove tricky. While Amazon owns both Kindle and CreateSpace, and they are both thick with cross-promotion, the release of a book on one platform does not automatically coincide with the release on the other. An author/publisher sets the release date on Amazon when uploading the manuscript. On CreateSpace, the book becomes available for publishing as soon as the author approves the proof. Then there is a short waiting period (3 – 5 business days) before the printed version of the book shows up on the Amazon page. I counted backwards from my release date and approved my proof last week, just in case, and technically it’s available now for order on the CreateSpace eStore. Amazon will promote authors as well, and have an entire online community set up to help their authors self-promote through Amazon. Only authors with a book available on Amazon can register for their own page, so I had to wait until the book was online before I could make that happen. 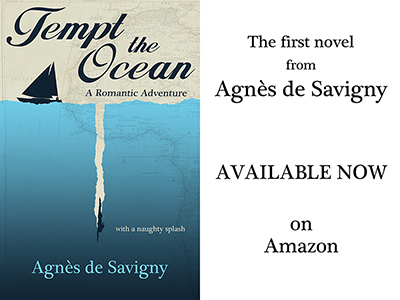 There is now an author page for Agnès de Savigny on Amazon US. I still have to configure the author page for the UK. I should be marketing the book like crazy now – especially with the big Christmas sales coming up and gift shopping climaxing for the season. I am doing my best with the time I have and the scope of my abilities, in between writing bursts of November’s novel. I have so much to learn. I did get a nice plug (pun absolutely not intended) from a romance/couples website through a colleague. 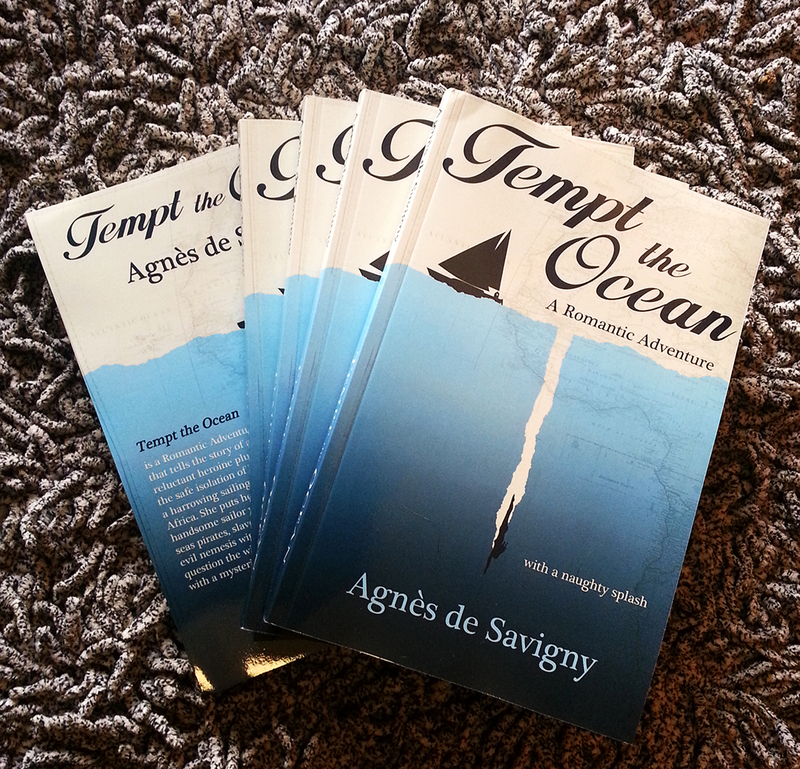 Sexpert.com reviewed Tempt the Ocean and the review includes a nice little excerpt. In the meantime, I have my blog as a platform to shout out my book. Here are the links to check it out. If a contemporary romance with a few deliciously smutty parts and some thrilling adventure get you excited, have a look and please, please, consider reviewing the book on Amazon.